Muslims are followers of Islam, one of the 6 religious groups represented in Crusader Kings II. Muslim non-nomadic rulers are playable with the Sword of Islam DLC. Islam has several mechanics not found in other religions and requires unique strategies. Generally, playing as a Muslim trades stability for better control of your traits and gene pool. Managing both will result in a stronger realm than most Christians. However, it's also easy to go the other direction, and have your entire realm destroyed in the blink of an eye. Islam is generally a very powerful religion in early start dates, with several large kingdoms and empires compared to weak and fractious Catholic realms and only the Byzantine Empire remaining to carry the torch of Eastern Orthodoxy. Though Christianity strengthens as time goes on and many of the Muslim realms fracture along dynastic lines in later dates, Islam remains very powerful well beyond Crusader Kings II's timeframe. There are three major denominations of Islam: Sunni, Shi'a, and Ibadi, which share a number of common features. Iqta government is a special variant of feudalism that allows nobles to hold temples without penalty. (As such, there are no theocracies in Muslim realms.) Iqta also allows tyranny-free revocation of duchies and vassal retraction. Additionally, without Conclave, law changes are unilateral by the liege and paid for with Piety rather than requiring vassals to vote their agreement. While vassal temple holders do provide Piety to their liege, the breakdown is not listed in the Religion tab like other religions. Modifiers which affect church opinion have no effect in Muslim realms. These include the modifiers from virtues and sins, the +20 from Theology focus, the -10 from joining the Hermetic Society, and the -10 from borrowing from Jews. Succession for Iqta and Tribal rulers is restricted to agnatic open (Turkish) succession, giving all titles to the most powerful son (or paternal grandson). Titles rarely split or consolidate due to inheritance. The Conclave DLC adds laws that allow feudal elective and other gender preferences for Iqta realms. Polygamy allows Muslim men to take up to four wives. 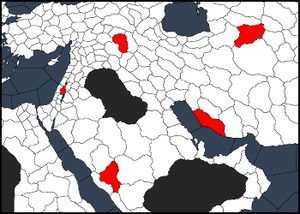 Decadence tends to weaken powerful dynasties in iqta and tribal realms, allowing lieges to revoke titles (using Fatwas) or even causing empires to collapse. Hostility among brothers and half-brothers: full brothers have -20 to their opinion towards each other; half-brothers have -40. The Sayyid trait denotes direct male-line descent from Muhammad's relatives. The Mirza trait denotes a son of a Sayyid mother. Both traits improve Muslim opinion and make it easier to declare oneself Caliph. A war with a Muslim of the same sect costs some Piety per month for the duration. County Conquest: For 50 Piety, a Muslim ruler may declare war for any province bordering their lands. Upon victory for a duke-rank or higher attacker, single-province counts are vassalized; otherwise the county is transferred to the victor. Invasion: For 1000 Piety, a Muslim ruler may attempt to conquer all territory in a de jure kingdom held by a ruler of a different religion bordering their lands. Upon victory, all vassals within the kingdom's de jure borders are transferred to the victor, while provinces held by rulers also owning land outside the kingdom are seized. Muslims may use the holy war CB against non-heretic Muslims of other denominations in addition to heretics of their own denomination and infidels. Muslims may target, or be targeted by, realms up to two sea zones distant before the era of great holy wars is unlocked. Muslims lose decadence with holy war victories, but gain even more decadence should they lose. Go on Hajj to Mecca, an event chain similar to pilgrimages found in other religions. Unlike the pilgrimage decision, it is available at all times, whereas pilgrimages require the Theology focus . Observe Ramadan, the holy month involving daily fasts by all healthy Muslims. This is a festival event chain that may be undertaken once every 5 years. It awards piety and reduces Decadence, and may add traits. Sadaqah (Voluntary Charity): Charitable works that pay 25% of your yearly income for piety and improved opinion from your Caliph, if one exists (cannot be performed by the Caliph himself). Most denominations and heresies feature a head of religion called a caliph or sheikh who has far more secular power than Christian popes or patriarchs. The caliph or sheikh can use their own unique Casus Belli, Caliphal Subjugation, to conquer kingdoms from rulers of the same religion. They can also call jihads to conquer kingdoms from infidels. Unlike Christian, Jewish, or Zoroastrian religious heads (but like the Reformed Germanic Fylkir in The Old Gods or any head of a reformed pagan faith with the Temporal leadership type), Muslim religious head titles are playable. Mecca: The birthplace of the Prophet Muhammad and the site where he received the first revelation of the Qur'an. All good Muslims who are physically and financially able are expected to undertake a formal pilgrimage, or hajj, to Mecca once in their lives, a practice designated one of the Five Pillars of Islam. Medina: Historically the secular capital of Islam and the city to which Muhammad and his followers fled to avoid persecution. Jerusalem: The historic seat of the Abrahamic faiths, to which God took Muhammad in a night journey during the revelation of the Qur'an according to Islamic tradition. Mecca and Jerusalem are important Silk Road counties. Map of Sunni holy sites. 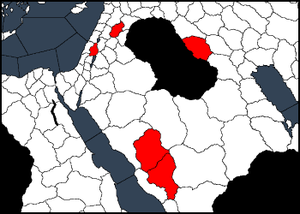 Much like the Great Schism in Christianity, the Sunni-Shi'a split is a defining schismatic moment in Islam's history, though its roots are mainly political rather than theological: a disagreement over the succession of the caliphate immediately following the Prophet Muhammad's death in 632 A.D. This led to an extended period of civil war resulting in the violent deaths of three of the first four caliphs. Sunni Islam, which won the initial sectarian conflict, holds that the Prophet Muhammad's rightful successor and therefore first Caliph of Islam was his father-in-law Abu Bakr. It has historically been the majority denomination. Sunnis' unique holy sites are Baghdad (shared with Nestorian Christians) and Cordoba (shared with Aztecs). Baghdad is an important Silk Road county. With the Sons of Abraham DLC, Sunnis can select between the Mutazilite and Ashari traits, representing belief in a particular flavor of Sunni Islam. Mutazilite adds +5 learning and provides technology boosts, while Ashari prevents personal decadence and provides piety boosts. Each trait has +15 same opinion and -25 opposite opinion. Sunnis gain a holy order, the Bektashi Order, if jihads are unlocked and either the year is 1228, or either Baghdad, Damascus, Cairo, Jerusalem or Mecca are not controlled by a Muslim character. The Umayyad Sultanate of Andalusia in 769, which usually expands to encompass all of the Empire of Hispania unless the player character intervenes. At the Stamford Bridge start, the empire has shattered into a dozen smaller realms, and Catholic Castille has taken most of Spain by the Rise of the Hansa start. The Abbasid Empire controls most of the Middle East from Egypt to Pakistan in 769. The empire still exists in 867, but is weakened. The Seljuk Sultanate is a significant powerbase in all bookmarks it is present in. In the Hundred Years' War start, the Mongol Golden Horde is Sunni. Sunni Islam has two playable heresies, Yazidism and Zikrism. Map of Yazidi holy sites. Yazidism is a monotheistic faith native to what is now central Iraq, believing God to have placed the Earth in the care of seven angels. Historically the Yazidis were persecuted well into the 21st century AD as purported polytheists and/or devil worshippers, as the Peacock Angel Melek Taus is equated by some to Iblis. In Crusader Kings II, the faith is implemented as a Sunni heresy with additional unique mechanics. Yazidism has its own unique set of holy sites, Nishapur, Dashtestan, Mosul, Mecca, and Jerusalem (the latter two shared with other Islamic denominations). No Yazidi rulers exist in the game by default, though the counties of Mosul and Kurdistan are majority Yazidi beginning in the Latin Empire bookmark. A Yazidi ruler who controls Mosul can declare themselves the Yazidi Sheikh, a caliph-equivalent religious head, by decision for 1000 Piety. In addition to the common powers of caliphs and sheikhs, the Yazidi Sheikh has the power to excommunicate characters. Being Sayyid or Mirza has no effect on the decision. Zikrism, also called Mahdavia, is a sect founded in India in the late 15th century (making its inclusion in Crusader Kings II ahistorical). It follows the teachings of Syed Muhammad Jaunpuri, who declared himself the messianic figure Imam Mahdi before the Kaaba in Mecca. Zikrism has no available religious head and thus cannot declare jihads. However, it is regarded as one of the better religions in Europa Universalis IV, so it may be useful to a player who plans to export their save to the next game. Map of Shi'a holy sites. Shi'ism, historically centered in Persia and later Iran, holds that Muhammad's rightful successor as caliph was his son-in-law Ali ibn Abi Talib (the 4th Caliph by the Sunni succession), rather than Abu Bakr. 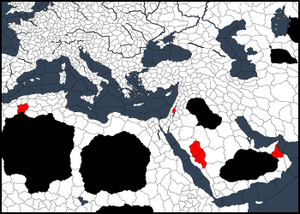 Shi'a's unique holy sites are Al Nadjaf and Damascus (Damascus is an important Silk Road county and shared with Judaism). If there is no Shi'a Caliph, a Sunni realm may experience a Rise of the Shia Caliphate event rebellion. Shi'a rulers and provinces exist at every start date, though they are more powerful as time goes on. The most powerful Shi'a realm in Crusader Kings II is the Ilkhanate in the Hundred Years War bookmark, a relatively large empire spread from the Caspian Sea to Pakistan. The Fatimid dynasty in the 1066 start holds Egypt and Jerusalem, as well as the Shi'a Caliphate, and is the strongest Shi'a realm in the standard bookmarks, though the Catholic Crusades targeting Jerusalem from the 1090s and onwards tend to severely reduce their strength. Shi'a gains a holy order, the Hashashin, if there are count+ Shi'a rulers in 1089 or later. Shi'ism also has a unique society in Monks and Mystics, the Assassins (who historically were the same group as the Hashashin). Shi'ism has two playable heresies, Druze and Hurufi. The Druze are a unitarian sect from Western Asia (most common in the Levant in modern times) that syncretizes Islamic philosophies such as Ismailism with, among others, classical Greek philosophy, Gnosticism, and Hinduism. They have frequently faced religious persecution and are not traditionally considered truly Muslim. Druze has no available religious head and thus cannot declare jihads. Hurufism is a Sufi movement founded in the late 14th century by the Iranian mystic Fazlallah Astarabadi. A Hurufi Sheikh title may be created by decision under the same conditions as a normal caliphate. Map of Ibadi holy sites. 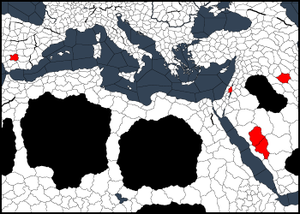 Ibadism is a primarily South Arabian and North African denomination said to predate the Sunni and Shi'a denominations, much as Coptic Christianity predates Catholicism and Orthodoxy. Ibadi beliefs are a blend of the other two major denominations. E.g. Ibadis agree with Sunnis that Abu Bakr was the rightful first caliph, but agree with Shiites that God will not show Himself to Muslims on the Day of Judgement. Ibadis' unique holy sites are the Atlas Mountains and Suhar. Ibadi and heretical Kharijite provinces are available in North Africa and southeastern Arabia (modern-day Oman) at all dates, but no Ibadi rulers exist after The Old Gods bookmark. An Ibadi Caliphate can be established under the same rules as a Sunni or Shi'a Caliphate. Ibadis gain a holy order, the Haruriyyah, if jihads are unlocked and one of the following counties is not under Muslim control: Hajar, Damascus, Cairo, Jerusalem or Mecca. Kharijites are a sect related to the Ibadis and deemed heretical by much of mainstream Islam. They reject doctrines of caliphal infallibility (agreeing with Sunnis, disagreeing with Shi'ites) and the Umayyad Caliphate's assertion of divine right, as well as the notion that imams and caliphs must be of the Quraysh tribe (favoring instead the quasi-democratic belief that any pious Muslim nominated by other Muslims may be caliph), and believe that any Muslim has the duty to overthrow a sinful or heretical ruler. They arose during the First Fitna, the succession crisis between Ali (who would become the 4th Sunni and 1st Shi'a Caliph) and Governor Muawiyah of Syria to succeed Caliph Uthman. Disagreeing with Ali for agreeing to arbitration to settle the dispute following his near-victory at the Battle of Siffin in 657, they rebelled against Ali and assassinated him in 661. A Kharijite Caliphate can be established for 1000 Piety by a ruler who controls either Mecca and Medina, or Jerusalem, Damascus, and Baghdad. The Sayyid and Mirza traits have no effect. Kharijites otherwise play identically to Ibadis. Muslim rulers do not have purely spiritual heads as Christians do. Instead, the religion is controlled by a secular Caliph or Sheikh who often controls significant amounts of land. Decadence: "deterioration, esp of morality or culture; decay; degeneration"
Muslim patricians do not have decadence. In return, they cannot hold mosques in their demesne without penalty. Decadence can be increased or decreased through various methods. Males of your dynasty with the Decadent trait. The chance to get this is increased by having sinful traits and decreased by being landed and having virtuous traits. Winning holy wars and contributions during jihads. If all else fails, killing the decadent member will remove both them and their Decadent trait. Banishing them will stop their contribution to the dynasty's decadence score if your realm is the largest one controlled by your dynasty. As can be seen above, the larger your dynasty, the more difficult it becomes to manage decadence. This game mechanic is a curse for the large caliphates but a blessing for the smaller ones, and since dynasties with lower decadence will have a combat bonus, this gives smaller independent Muslim states a fighting chance. Furthermore, as Muslim rulers have more wives, this produces larger dynasties which then makes decadence management more difficult. One strategy for managing decadence is to marry wives who are past child-bearing age, but still have one or two to bear the required heir(s). The chances to gain the Decadent trait increase with sinful traits such as Craven , and Arbitrary . Landless characters are also more likely to become decadent. Polygamy is simultaneously a blessing and a curse. The advantages are that you will almost always have a capable male heir. And, with Turkish succession, you can give one of your many sons with good congenital traits land, and he will become your heir. You also have up to four wives to pick from for traits without requiring a divorce, instead of just one with other religions. Muslims also establish non-aggression pacts and alliances through their secondary wives as well as the primary wife. The disadvantages are that, out of your FOUR maximum wives, only one can be your primary wife. This is a prestigious position, and secondary wives with good Intrigue will take desperate measures to ensure that she is the primary wife (like killing her). Wives will also kill the children of other wives, to ensure that their child is heir. A good way to counter this is having good Intrigue yourself and a good Spymaster. By placing your Spymaster in your capital to Scheme, you can discover plots by your other wives against your primary wife or preferred heir. You can then ask them to stop or throw them in the dungeons and banish/execute them, depending on how tyrannical you feel. Another possible solution is having your wife with the best Intrigue be your primary wife. Most rulers will pick the wife with the best traits overall anyway, but if you pick the wife with the best Intrigue and pick one of her children as your heir, then she will not plot against you or your children or sic drunken assassins at you. The problem with picking a child of your primary wife is that he may not necessarily be the best ruler, and there may be a better child sired by your secondary wives. A good compromise is to have two young wives with good traits and two others who are 40 (the oldest age at which marriage can be arranged for rulers). Tribal Muslims use the concubinage system; note that tribal rulers cannot ask for concubines from iqta rulers. You'll have to invite women from iqta realms to your court before making them your concubines. Polygamy is a major advantage for Muslim patricians over non-Muslims, as they are exempt from decadence and the family's trade post limit is increased by unlanded adult male dynasts in the patrician's court. It is far easier for polygamous Muslims to sire many legitimate sons (up to the cap of ten living legitimate offspring at a time). Your father has gone to ride the white camels and eat raisins in paradise. You have the most or best titles or are otherwise heir. Since your father likely had many wives, you likely have many rivals. This is the best time to begin planning for future decadence. Upon succession, the game models Ottoman Turkish succession (first son back to the capital kills his brothers and rules). Hopefully, your father planned for your succession by marrying 1 or 2 old women (45 and above; use the character finder as using the "rings" button sets the maximum age of the bride at 40) and educating your brothers for contentment and virtues. That will almost offset the full/half brother relations penalty. With the Conclave DLC, Muslim realms can gain access to feudal elective succession. This requires passage of the council law "Full council authority". Enacting the "Full status of women" law allows daughters to inherit; however, they cannot take multiple husbands. Feudal and clerical tax and levy laws are combined as iqta laws for Muslims. The default tax rate is higher than normal feudal taxes, so Muslim kings tend to be richer than Christian kings. The difference is more pronounced when compared to Catholic realms, due to the taxation issues surrounding Catholic bishops and the Pope. Unlike Tribal and Feudal governments, rulers of Iqta governments can revoke duchies freely and retract vassals without incurring tyranny. Needless to say, this is extremely useful if one of your vassals gets too powerful — and if they rebel, that just means you might get a chance to take their sheikdoms as well! All Muslim types (except Yazidi) do not allow marriages between uncle-niece and aunt-nephew. Unlike Christian realms, Muslim realms do not vote for law changes. A Muslim ruler can change it at will. However, it costs a small amount of Piety depending on the type of law being changed. (50 for Demesne and 100 for Crown). However, with Conclave, after the council law "Empowered Council" is enacted, law changes will function the same way as under regular Feudal government. Muslims cannot adopt this focus unless they are Decadent , Drunkard or Hedonist . Also, AI Muslim characters will never agree to join a party unless they have one of the above traits. This page was last edited on 17 April 2019, at 17:10.